We mentor lawyers. It's as simple as asking a question. It's a 2-step process. Get answers to questions across all areas of general practice. From desktop or mobile. Answers sent directly to your email, usually within 24 hours. See a selection of questions and answers below. A research tool where one can search and browse 5308 Q&As and counting. Subscribe. Log in. Ask a question. Mentor will email an answer, usually within 24 hours. By Lawyers guides include commentaries and precedents. By Lawyers are the exclusive content providers to LEAP Legal Software. 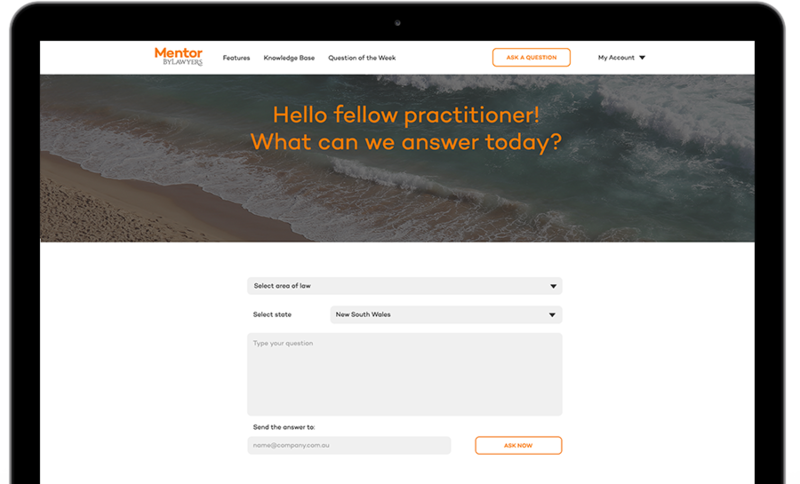 Mentor answers questions that arise in general practice in most areas of law. Your firm's subscription may be used by all members of staff, with answers directed to your personal email address. A research tool where one can search and browse over 5303 Q&As and counting. Mentor is a confidential service. Selected Q&As may be included anonymously in our knowledge base – unless you instruct us not to. Join for a minimum of 12 months. Pay monthly or annually. “I am a Licensed Conveyancer and I have used the Mentor Service since October 2013 and I still use it at least once or twice a month. On all occasions the Mentor Service has been professional, highly efficient, prompt with replies to emails and in good detail. Having used them for so many years and having experienced excellent service, I would highly recommend the 'Ask a Question - Mentor by Lawyers' to anyone looking for further information or who has any type of conveyancing questions. Thank you for creating such a great service."